When you create a runtime you can now create a server at the same time. If this option is available for the runtime you're creating, just select the Also create new local server option at the bottom of the dialog. The Servers view context menu has been improved for Eclipse consistency and new options have been added, along with a Properties dialog. The Servers view has a new Clean... option which will perform a "clean" publish on the server. Much like clean builds, this will remove any invalid resources from the server before doing a full republish. A new binary format and removal of duplicate information have improved both the size and performance of storing the publishing history file by 70-90%. This improvement will decrease workspace size and improve publishing performance for extremely large applications. Thanks to a donation from ATF, WTP now supports publishing static web applications to local HTTP servers! You can specify the directory to publish to, which port the HTTP server uses, and any URL prefix that your Apache (or other) HTTP server uses. Want to compile or run a web application quickly, without waiting to download or install an external server? The new Preview server allows you to do exactly that - it supports static and dynamic web apps and allow you to preview their function on the embedded Jetty server. 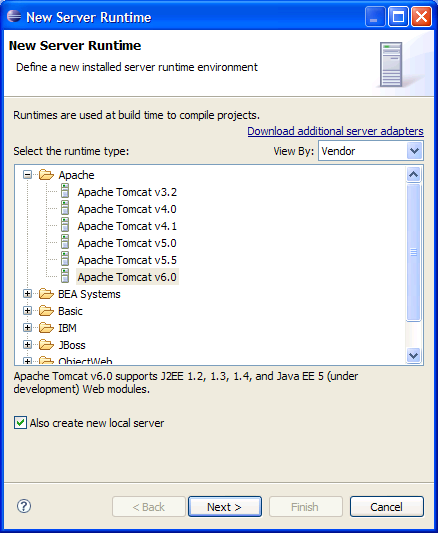 WTP now supports Apache Tomcat v6! Need to clean Tomcat's work directories? 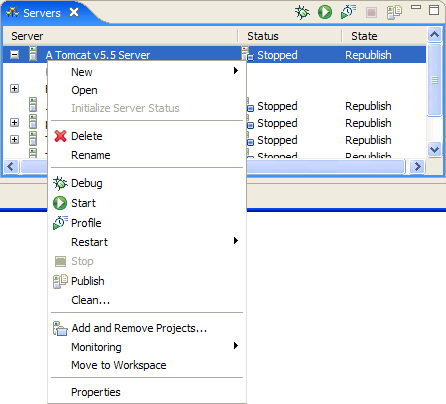 Two new menu items in the Servers view allow you to Clean Tomcat Work Directory or Clean Module Work Directory without leaving Eclipse. There are new user settable paths for the Tomcat server (with server editor UI still under development). 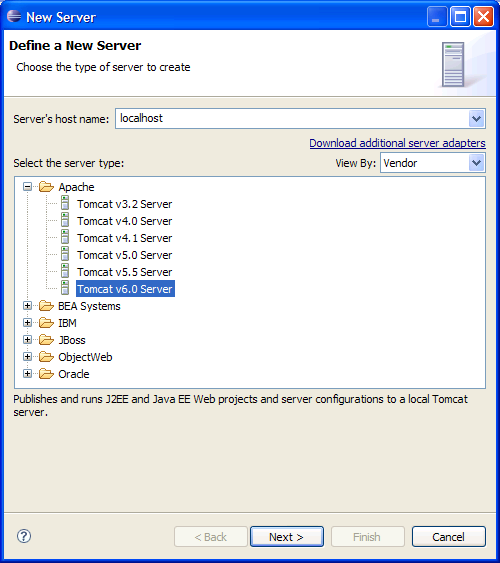 The Server path allows you to specify a separate instance of the Tomcat server at a location of your choice. The Deploy path allows you avoid using the "webapps" directory and the complications that arise with auto-deployment and default web applications. Two new options which affect publishing are now available in the Server Options section of the Tomcat server editor. The Tomcat server must be 5.0.x or later for these options to be enabled. The Serve modules without publishing option does what it says. Web content will be served directly from the "WebContent" folder of the Dynamic Web Project. A customized context is used to make the project's dependencies available in the Web application's classloader. The Publish module contexts to separate XML files option will publish contexts using the preferred method of separate XML files under the "conf/Catalina/localhost" directory, rather than keeping them in the "server.xml" file. A couple of improvements for this option are noted in Bugs 180931 and 180936. Have you ever used Run on Server, hit a bug in your application, and then hit F11 to test again, only to find out that it tries to start the server again instead? This long standing and annoying bug has been fixed, so you can now use F11 (or Ctrl-F11 for debug) to rerun just the last html page or EJB. The Servers view is no longer blocked from opening until the servers API is done initializing. The Servers view now appears immediately and shows the text "Initializing..." until servers have been loaded in the background. This change is consistent with JDT's approach to background loading and will allow perspectives containing the Servers view to appear immediately instead of being blocked by workspaces with lots of servers or adopter extensions.